The need for education in Nicaragua is overwhelming. 35% of school age children are not in school. There are many reasons for this staggering reality, and we can only address some: access, quality, and cost. For the communities of Tipitapa, San Benito, and Alamikamba, we have dedicated a large amount of time and resources toward education. And it's working. The Christian schools founded and operated by Harvest Initiative have served hundreds of children in Nicaragua. These children, from 15 in the first class to over 730 students now, would likely not have attended school without the efforts of the schools and their stabilizing presence in the community. At present, there are two schools, Colegio El Pequeño Benjamin (Pi-cane-yo Ben-ha-min: Little Benjamin) and Colegio La Cosecha (La Co-say-cha: Harvest Community School). In addition, Harvest Initiative is working with communities in the Alamikamba region to provide educational opportunities and computer training there. The school directors, Danira Sanchez and Alexandra Mendoza, are true blessings to us and to the students they minister to in the schools. These women and the teachers they supervise make these schools a true outreach ministry. The schools are operated in coordination with local churches to ensure that the school programs are tied to the life and outreach of a Christian community. What makes these schools so effective? For many students, the walk to the nearest public school is simple too far to make. This is especially true for younger children. Even older children struggle during the raining season when roads can become impassable. By being at the heart of their communities, these schools provide centralized, accessible facilities to learn in. And this means more children attend and stay in school. Because the schools are located in very poor neighborhoods, crime and violence are prevalent. And many children face desperate poverty and even violence at home. For these children, school and church are their only safe places to be. At school, behind a security fence manned by a guard, students can learn in peace-though not quiet! Tin roofs and open classrooms make school a bustling and noisy place, but they are safe.. The Bible is taught in each and every classroom, from pre-school through 5th Level. This is so important: Biblical truth and biblical role models give students a real alternative to spiritualism and apathy.. Recently, three students and one mother were baptized. It has been a great privilege to impact so many lives through the school programs over the years. And we pray for continued open doors to make our strengths even stronger and to equip communities and students through truth and education. . The directors for these schools are amazing! As are the teachers. These men and women work hard to create a sustainable environment where students can learn and grow. The directors and teachers attend trainings to improve their teaching and administrative skills. They have also initiated after school programs that have allowed students to participate in science fairs and craft fairs. These activities build skills beyond traditional classroom instruction and add to the vibrant life of the school.. They operate on sound financial principles. The schools operate on a budget. That budget is funded through wonderful donors in the U.S. and through school tuition.. The schools are fiscally responsible, but not locally sustainable. Students pay tuition-about a day's wage per student monthly. This is important as it makes a child's education an investment for the entire family. The investment, however, does not cover the schools operational needs. Staff, utilities, supplies and government fees exceed tuition costs. Support for keeping these schools going comes from all of you-from the individuals, churches, and organizations that partner with our efforts..
For those families who cannot afford tuition, there are scholarships. About 10% of students are on scholarship, paying nothing to attend. This balance reflects God's tithe and is a way for the school and mission to give back to the community.. Recent changes in donations have made funding these schools more difficult. Please consider supporting Harvest Initiative as we partner with the community for Christian Education. They are more than schools..
At the San Benito school alone this year, two families have had parents murdered, leaving 5 of our students in the care of neighbors and grandparents. In these critical situations, and situations different but no less extreme, the mission schools are the most stable and healthy factor in these children's lives. In such critical situations, our concern goes beyond education and we provide food and medical assistance. In this way, the schools are more than schools. They are centers for community aid, care, and comfort. They help to stabilize communities and give parent and children hope for better things..
We envision, with God's help, a small residential center for some of the children in the most desperate situations. Also we are praying for ways to extend education as part of our outreach in the Tribal Areas. Pequeño Benjamin is one of HI's longest running projects-probably because we had the good sense to give its operation over to some very faithful and remarkable Nicaraguans. 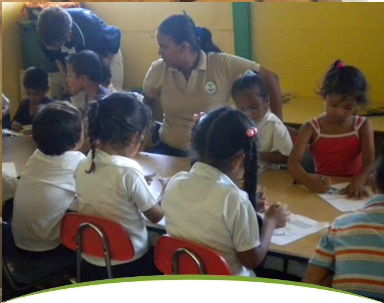 Located in Tipitapa and founded in 1999, the school enrolls 520 students from Preschool to Secondary. The Director, Alexandra Mendoza, leads a staff of 23 teachers and support personnel. 2014 marks the first graduating high school class; 12 students received their diplomas. Only about 7% of Nicaraguans have graduated High School, so a diploma puts a young person in a very good position to escape poverty. To allow for continued expansion, the first of several planned second story classrooms has been added. La Cosecha is newer-just a few years old. It began much as Pequeño Benjamin did: a small school on dirt roads in a poor community staffed by dedicated teachers who wanted good things for their children. Located in San Benito, the school has 215 students from Preschool to Sixth Grade. It has grown enormously since its foundation in 2010 as a single-room tin schools house. It now has 5 classrooms, and more are needed. In 2014, HI was able to improve teachers' salaries and enroll them in insurance and retirement plans. 2014 was also the first year that fifth and sixth grades were large enough to have separate classes. Enrollment grows each year and student attendance has greatly improved, as has staff morale. Additional adjacent land was purchased in 2014 to allow the school to expand. The north section of the perimeter was also completed. Danira Sanchez and Carolina Escorcia, the Director and Assistant Director are incredible ladies who do far beyond what is required for their roles. Please pray for these two ladies: they make the school a real ministry. Danira and her husband Pedro also organize Bible studies and outreach activities for the students and their families. We have been in Nicaragua full time since 1995 working to catalyze community development projects. 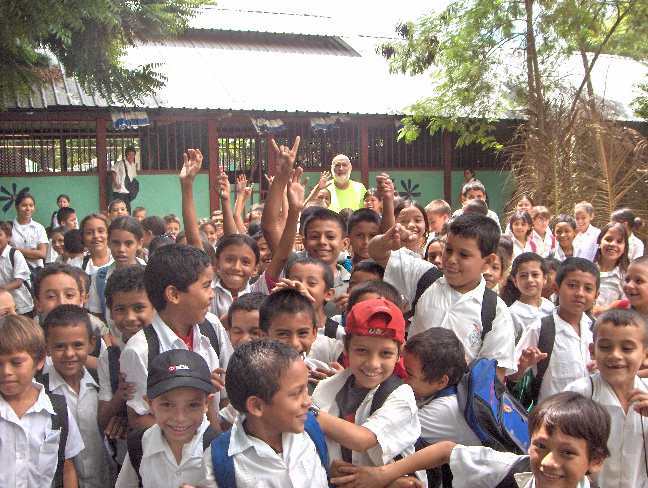 Three Christian schools have been founded with the help of committed Nicaraguan co-workers. A big part of our job is helping the Nicaraguan leaders equip the churches to reach out as Christ reached out to a people tangled in vices and ground down by poverty and hopelessness. So far we have helped the new churches establish ministries such as , an agricultural loan program, and a technical vocational shop, small business incubator and water projects.